Your home is not just the place where you hang your hat at the end of each day. It’s also an extension of your life, your interests, your personality and your dreams. 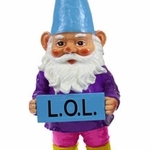 Make your home more expressive of your style with these fun garden signs. At Garden Fun, we believe that garden welcome signs can truly enhance the appeal of your yard and home, while also making guests feel welcome and comfortable. That’s why we've created a variety of decorative garden signs and metal welcome signs that can make any home more appealing. 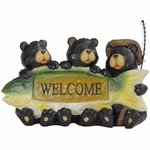 Some of our most popular garden welcome signs feature animals. Our wall-mount butterfly welcome sign, for example, features brilliant orange and pink colors along with a feminine, flowery look. Meanwhile, our hummingbird welcome sign features gorgeous green hues that are great for complimenting the colors in your garden. 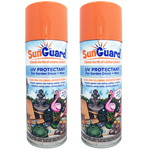 We also offer fun decorative garden signs and metal welcome signs that feature sea turtles, grasshoppers, geckos and other interesting creatures. For those who love domestic pets, we also offer metal welcome signs with dogs and cats to show your love for your very own furry friends. 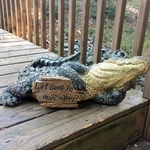 If you’re looking for creative welcome signs for gardens and yards, then you've come to the right place. 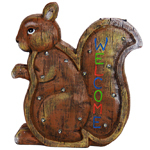 Browse our selection of welcome signs for the garden and metal door signs to find the product that fits your home and your personality. 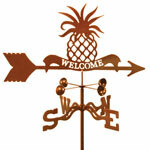 In addition to these fun garden signs, you'll also find a great selection of door hangers and garden stakes. 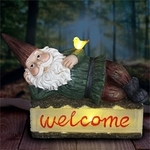 We even carry adorable garden gnomes to complement your garden welcome signs. For many of our products you can choose an optional garden mounts for easy display of your chosen sign. 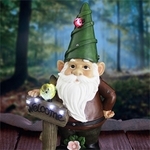 Whether your choose our wall-mount butterfly welcome sign or a simple garden stake or garden gnome, we have all the products you need to create a fun and inviting look in your yard.